I am pleased to note that most weekends recently have involved a good bit of Jaguar restoration, although a major distraction occurred when Kelli convinced me to hire someone to refinish all of the wood floors in the house. He did a great job on the floors but yours truly had to move everything in the house out of his way. Twice! They do look great and I’m really glad that is done. But I digress. When I had reached the end of the restoration of the independent rear suspension (IRS), I came to the point where I needed to install the brake lines that are hard mounted to the IRS. I wanted to do this before I installed it into position, as it would be infinitely easier. I went so far as to buy a length of brake line tubing from the local auto parts store, with visions of me happily bending and flaring my way to new brake lines. But after looking at tubes that connect the wheel cylinders together, called crossover pipes, I realized that the bend radii were much too tight for my bending tools. I checked out the Classic Tube website (www.classictube.com) and discovered that I could get an entire set of brake lines bent in stainless for about $250, including the crossover tubes. I called them to place more order. No problem, except they were 5 weeks behind. Regardless, I placed my order and got in line. Next, I pulled out the master cylinder and the slave cylinder from the parts storage bin. Getting both apart was no easy task. On the master cylinder, you really need to rig up a fitting to apply compressed shop air to the inside of the cylinder in order to force the internal parts out. And don’t be standing in front of this improvised gun when it lets go! I eventually got everything out of the cylinder, cleaned up the bore, and examined it under a good light. There were definate signs of corrosion at the bottom of the bore, which is typical when water settles into the system. As new cylinders are expensive, this was an excellent candidate for re-sleeving. 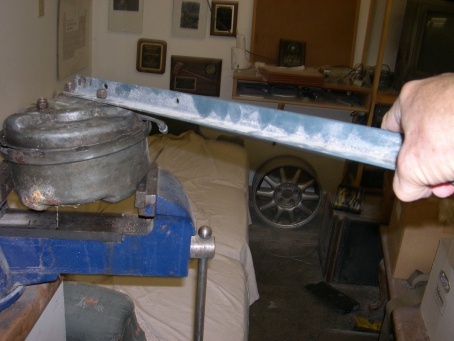 Re-sleeving involves machining the inside diameter of the bore approximately 1/8″ larger. Then a thin cylinder of brass tubing is press fit back into the bore. The inside diameter of the brass tubing is selected to match the original ID of the cylinder. Various folks specialize in this process. Check out the ads in Hemmings Motor News. I chose Sierra Specialties in California, based on positive recommendations from the Jag-Lovers forum. Getting the slave cylinder apart involves an extra step, as the vacuum booster needs to be removed first. This is the big round canister mounted on the front of the cylinder that provides the “power assist” feature. The cylinder comes in 2 halves. If one half can be rotated just a few degrees, fingers align with slots to allow the 2 parts to separate. The trick is getting it to rotate. Mount the bottom half is a stout vice. There are 3 mounting studs on the cover that normally attach to the firewall. Obtain a 2 to 3 foot length of steel bar and drill 2 holes in one end at the same spacing as the studs. Slip this over the studs and tighten it down with nuts. You now have a lever arm that should be sufficient to break the cover loose. Once the cover is removed, the internal mechanism comes apart without too much fuss. It helps to refer to the exploded diagram in your Bentley shop manual to make sure you find and remove all the pieces. Once I finally had the bare cylinder apart and cleaned up, it appeared to have corrosion in the bore also. So it went into the box to also be shipped to Sierra Specialities for sleeving. While I was at it, I threw in the 4 front wheel cylinders. Everything was brought down to the post office for shipment. Sierra Specialties called me about a week later. “One month backlog! Could I wait?” Sure, why not. I’ve got infinite time to finish this job! Next, I bead blasted the 2 parts of the booster and shipped them off to Industrial Electroplating in Gastonia to be zinc plated with a clear phosphate coating. This is the same coating that I had previously applied to my front suspension parts. There was certainly no lack of other tasks to attend to. I call them Odds and Ends. First up was installation of the gas tank. Last year, I had re-furbished the gas tank. This involved sand blasting the exterior for a repaint using epoxy primer and black single stage urethane and treating the inside of the tank with a restoration kit that I bought from POR-15 (www.por15.com). Now, I needed to perform some final assembly. The E-Type gas tank has three openings, 2 on the top and one on the bottom. The one on the bottom is for the sump. There is a threaded brass cylinder that screws into a fitting on the bottom of the tank. If you look under the back end of an E-Type you will see it extending down threw a hole in the bottom of the sheet metal. The sump serves several purposes. It serves as a low point in the tank from which the supply tube to the fuel pump takes out the gas. With the sump removed, you could clean and/or replace the metal mesh “sock” that fits over the supply tube. The sump also will serve to collect any water that settles out. There is a screw in the bottom of the sump, similar to the one for the oil pan on the engine, that can be removed to drain water and/or gas. 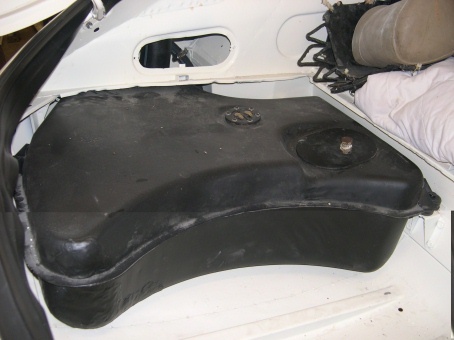 You should test fit the sump but do not install it yet, since if you do you will never get the gas tank into the car. 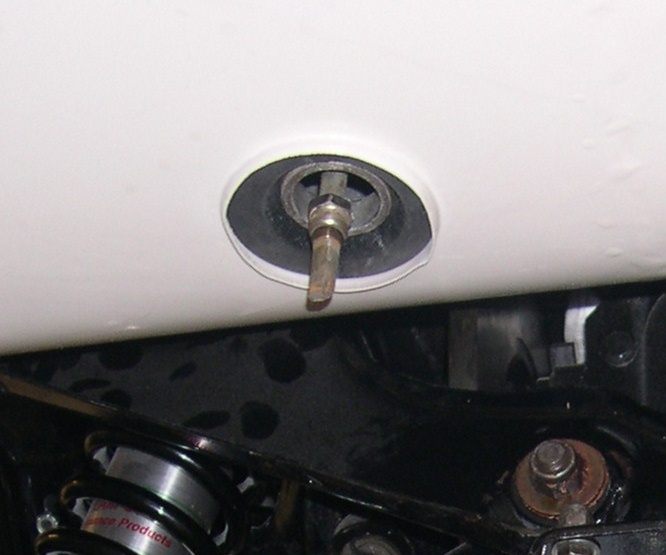 Directly above the sump on the top of the tank is a gasketed opening for the supply tube. I mistakenly thought that I should install this assembly before putting in the tank but I found out I was wrong. The supply tube extends just far enough below the bottom of the tank to hang up when trying to install it in the car. Finally, there is a gasketed panel that holds the fuel level gauge mechanism. You will want to verify that the mechanism is working properly before you install it. This mainly consists of checking with an ohmmeter to confirm that the resistance varies in a fairly linear fashion as you move the float arm through its range of motion. Fortunately mine worked fine as I think getting a replacement might be difficult. I went ahead and sealed both faces of a new gasket that I got from Terrys Jag and installed the assembly into the top of the tank with its small screws. Since the gas tank is physically inside the interior of the car, you will want to do your best to seal it completely, to prevent gas odor in the car. The gas tank sits on 3 rubber donuts for its mounting points inside the car. I also bought these from Terrys. There is a short piece of fuel hose from the filler neck on the left side fender. I was surprised that non of the “usuals” carried this hose and that it is an odd size not carried by auto parts stores. I managed to find one on E-Bay. I think the price came out to be about $80 a foot. It’s good that I only needed a 4″ long piece! This hose needs to be slid up as far as it will go on the filler neck prior to installing the tank. There are also 2 smaller hoses in the same vicinity. One is from a tank vent and the other is a drain for the filler neck area. It is best if you have both of these partially installed before installing the tank. Finally, there is a foam rubber donut that goes between the tank and the floor of the car, around the sump. I was able to get this from Terrys also. The fit of the tank into the car is very tight. I had test fit it before I did my final painting so I new it would go. Still, it was a struggle. Finally, as it appeared to be in position, I tried to get the 3 mounting bolts started into their captive nuts attached to the car. These fought me for quite a while before I found the “sweet spot” on each one. But eventually I got everything in place and tightened the tank down, hopefully for the last time! Next month we’ll talk about installing the rear deck lid and its glass.